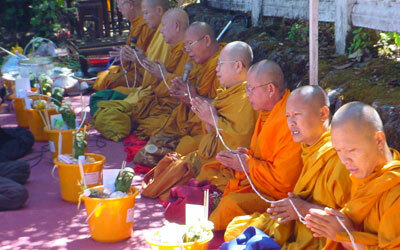 On March 20th, the Sueb Chatta Doi Luang or Prolong Life Ceremony took place at Doi Inthanon National Park. This is an old tradition amongst the northern villagers living around Doi Inthanon, and has been practiced for many years. 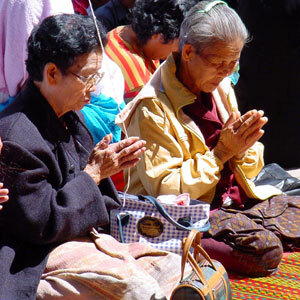 Villagers pay respect to the monks. 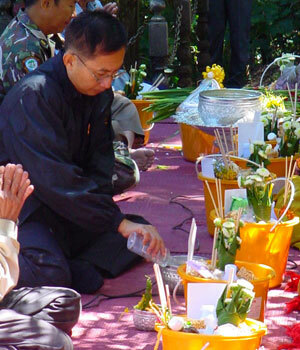 District Chief Pornsak Sanguanphol performs a ritual to make merit to the holy power of Doi Inthanon. After the ceremony had ended, the villagers take some Sai Sin home for good luck. The ceremony is to extend the lifespan of the Doi Inthanon National Park, which is the highest mountain in Thailand, by praying to the gods to ask for rain to ensure the fertility of the mountain. Additionally, this ceremony is also to remind all villagers to love each other, and to care more about their mountain. Pornsak Sanguanphol, district chief of Jomthong district, and Boonreaw Butta, village headman of Jomthong district, both leaders of the ceremony, said that the organization was a joint exercise between the mine chief and the Forest and Water Source Conservation Club, in close cooperation with all the villagers of Jomthong. 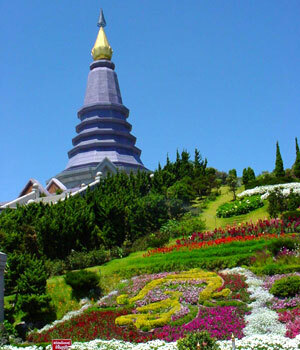 The ceremony took place at the highest spot of the mountain, near the Doi Inthanon memorial shrine. 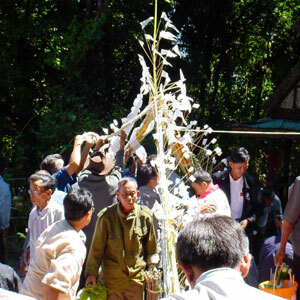 In the past, this ceremony had been arranged by the Doi Inthanon National Park Office, however, several people remarked that too many groups are now involved in the organization and most of the authenticity of the festivities has been lost. Monks preach for an hour. The beautiful Doi Inthanon Pagoda. 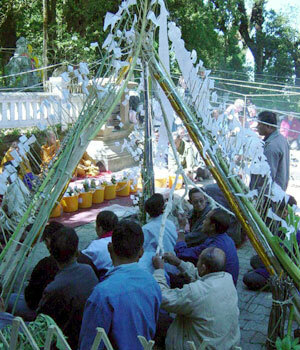 Elderly villagers prepared the Sai Sin for this year’s ceremony. 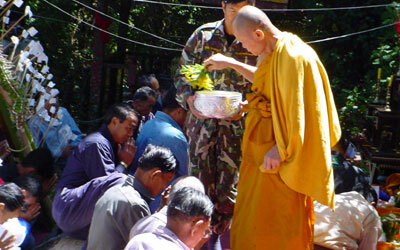 A revered monk sprinkles holy water over the villagers. 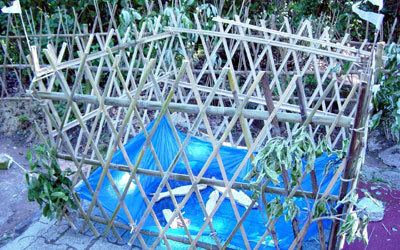 The ceremony started at 10 a.m. when the elders from the village prepared ‘Sai Sin’ (a protective thread for preventing evil influences), encircling the ceremony place. They had also built a ‘Mai Kham Chata’ (a fork of tree respected for supporting one’s fortune), and a fish pond containing 3 wooden snake head fishes. The villagers believe that the snake head fish is indeed the king of fish. This is considered a Buddhist religious belief, as it is Buddhist folklore that the Buddha once asked a snake head fish for water. Pornsak Sanguanphol, district chief of Jomthong invited 9 monks to the ceremony, who held prayers for an hour. In true tradition, the ceremony ended with a monk pouring holy water over everyone. The fish pond with the wooden snake head fish. Mai Kham Chata (tree fork ‘supporting one’s fortune’). This year’s ceremony is over, but the elders hope that the villagers from Doi Inthanon will pass on this beautiful traditional to the next generation, so it will always be remembered and not fade away. Next time you are showing your friends around in Chiang Rai or in the area, do not just follow the ‘normal tourist route’, but rather try to find some things more special which will stay in their minds as much as in yours. Such a spot is Mae Salong. One of the many beautiful sights on the way to the monument. The brave old man who watches over his general. He did not leave him for the last 58 years, and he will not until he dies. Flowers along the way to Doi Mae Salong. 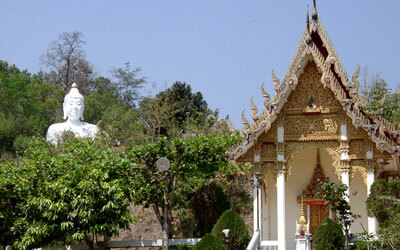 Mae Salong, a small town about 80 km northeast of Chiang Rai City, can be reached via Mae Chan. What makes this little village so different from others is its Chinese populace. The inhabitants are mostly the families of Chinese Kuomintang soldiers who fled from the communists in 1949, first to settle in Burma. They were driven out of Burma in 1961, and then settled on Doi Mae Salong (Mae Salong Mountain), just 7km from the border with Myanmar, as it is known today. The cuisine as well as the architecture is Southern Chinese, and despite many tourists having already found Doi Mae Salong, it has kept its own distinct appearance. What impressed our group most was its cleanliness. The entire little village, the streets, houses, gardens, whatever you looked at was spotlessly clean. When you reach the peak of Doi Mae Salong, you will see many tea and coffee traders, with both being grown and cultivated in this area, plus an impressive monument on the very peak. What many people do not know is that this monument shelters the tomb of General Duan of the Nationalist Chinese Kuomintang Army. This tomb is guarded by a single man, a lonely old soldier. KMY General Duan has been dead for a long time, but when he first arrived in Thailand some 58 years ago, he found a little Taiwanese boy, by that time 15 years old, who had lost both his parents in the war. 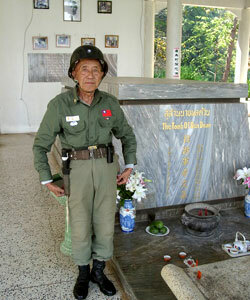 He took this little boy under his wings, treated him like a son, and now, at the age of 73, this orphan of decades ago watches over the general’s tomb. He lives behind a demarcation of plastic, sleeps in a deck chair and just does not leave HIS general who once saved his life. When we asked his permission to take his picture (quite a task, talking with hand and feet, because he does not speak Thai well enough, no English, and our Chinese is also a little rusty), he turned around, rushed back to his ‘quarters’, and, proud as one can be, returned with a steel helmet, changing for the baseball cap on his head. He seemed to grow proudly while we took turns taking a photo with him, and when we walked down the stairs from this memorial site, he called out in Chinese to a couple of vendors who came rushing to us to feed us with freshly brewed tea and sweets - complimentary, as if they were happy that we had treated the old man so nicely. The bottom line - this is a highly recommended trip, not only for the sight from the top of Doi Mae Salong, but also for this little Chinese enclave where Chinese traditions are still practiced and alive. For the very first time, Chiang Mai was represented at the International Tourism Bourse (ITB) in Berlin earlier this month. This mega travel fair is the most important event for the world travel industry, and Chiang Mai needed to show what it has to offer. The delegation was comprised of all the ‘heavyweights’ in the tourism and hospitality industry, Pornchai Jitnavasathien, Chiangmai Municipality councilor; Chalermsak Suranant, director of the TAT Northern Office Region 1; Vorapong Muchaotai, president, and Jin Sukumarabandhu, vice president of the Thai Hotels Association Northern Chapter; and Boonlert Pereira, president of the Tourist and Business Association. Everyone wanted to be pictured with Kh. Pornchai. The Chiang Mai delegation was a colorful showstopper. In an exclusive interview with the Chiangmai Mail, Pornchai expressed his surprise as to how big the venue had been, and how professionally it had been organized. “It was a bit ‘spicy’ that the Thailand stand was next to the one from Cambodia,” he added. Chiang Mai’s exhibition space had been set up as a boat, beautifully decorated and appointed in traditional Lanna style, reflecting the beauty of the ancient Kingdom. “We had so many visitors who had never heard about Chiang Mai and the numerous possibilities to spend their vacation here,” Pornchai said. The interested visitors fell into distinct groups, with 20% below the age of 40, 30% were the so-called backpackers, and 50% were from the ‘over 50s’ age group. “We have made it perfectly and impressively clear that Chiang Mai and the North of Thailand offers something for everyone. It’s not only handicrafts, it’s also golf, Kanthoke dinners, spas, excursions to the mountains and it’s waterfalls and temples. We welcome all, and we guarantee your safety, and that you will take unforgettable memories back to your home country.” Pornchai added that Chiang Mai always had those strong selling points, but until now they were never properly and professionally presented. Earlier this week, Chiangmai Mail had the opportunity to meet with one of the driving forces behind most of the tourist-related activities in Chiang Mai, the dynamic Chiangmai Municipality councilor, Pornchai Jitnavasathien. Chiang Mai Municipality councilor, Pornchai Jitnavasathien and Michael Vogt, Chiangmai Mail MD. Getting ready for Songkran – clean up time all over the city. Michael Vogt, Chiangmai Mail MD advised Pornchai that the Chiangmai Mail had received a number of complaints from readers, saying that the Songkran activities have been getting ‘out of hand’ recently. With dirty, smelly water being thrown around, chaos on the streets, and mentholated powder in the eyes, it has made many residents of Chiangmai rather stay at home. The overwhelming feeling was that they would appreciate a return to the traditional style of celebrating Songkran, as it was traditionally done, being a mark of respect for the elders. “We have heard that too,” Pornchai responded, “and we have designated one full day of the festival to be a traditional day of celebration.” The following is a brief rundown on the activities planned for that ‘special’ day, Monday, April 14. The main activities will be held on Tha Pae Road, which will be closed to traffic from April 13 - 15. From noon until midnight on Monday the 14th, there will be an ongoing display of ancient traditions, including the water pouring ceremony “rod nam dam hua”, or ‘showing respect for the elderly’. The use of heavy-duty water guns, and throwing of full buckets of water will not be allowed in this area, and the authorities will make sure that the regulations will be strictly adhered to. 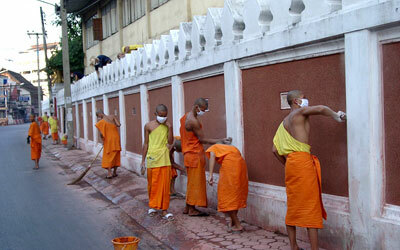 Traditionally, during the Songkran period, Buddhists all over the country will take sand to the temples. In Chiangmai this will start one week before the actual Songkran Day, with students from the different Chiangmai universities having to build a chedi, one in each temple on Tha Pae Road. They have one week to complete the chedis, which will be presented to the public on Monday the 14th. Pornchai said this was not a competition as to which chedi will be the most beautiful, but every participating university will receive an allocated budget of 10,000 baht, so every team will be a winning team. In the center of Tha Pae Road, a huge marketplace will be set-up, offering the ever-so-popular Thai handicrafts. Great bargains are guaranteed. There is no event without some type of a competition in Thailand. This time it will be a “Northern Traditional Music Instruments” competition. A number of bands will perform traditional and contemporary musical pieces, played on ancient northern instruments, both wind and string. Songs have to be sung in the northern dialects, and all winners will be announced, the same night, live on Channel 11, between 10 and 11 p.m.
As that special Songkran Day will also coincide with the 707-year celebration of Tha Pae Road, and with all these activities going on, it will certainly be worth a visit. 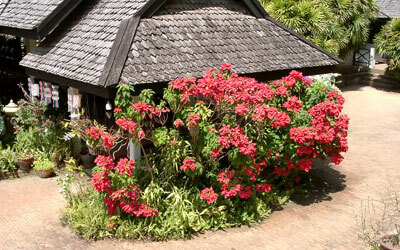 Your Chiangmai Mail will certainly be there, equipped with waterproof cameras and an umbrella - one never knows! Before moving to Chiangmai, our family of five stayed at the Oriental Hotel in Bangkok for over six weeks. We knew then the lovely twenty-eight year old Ankana Gilwee. Ms Ankana, now the most-tenured employee at the Oriental, is enjoying her fifty-sixth year with the famous institution. She is the guest relations coordinator and has created a connection for my children and me to the past. Among the memories of daily life there - far different from anything we’d known back in Tennessee - were the spectacular presentation of food in the open-air verandah restaurant, the warm personal service, the delightful view of the Chao Praya River and playing on the lawn. The hot pre-monsoon weather was more tolerable with limeade drinks to quench our hot thirst. I recall that my older brother Henry was enthralled by the rumor that the Oriental lobby boasted Asia’s highest concentration of spies. Our upstairs room had five army-type cots lined up in a row with mosquito netting. This room has now become one of the famous authors’ rooms in the historic wing. Once we got settled in Chiangmai, the children having been out of school for over two months, my parents thought education was the first arrangement to put in place. My brothers Kenneth and Henry left every morning with the driver to go to school. I knew that Henry went to Margaret Wells’ School at the Prince Royal College; this was a school the missionary’s wife set up for the half-dozen or so American high school kids. I have heard that perhaps this school became The International School. I only learned recently that Kenneth was tutored by another mother in their home. 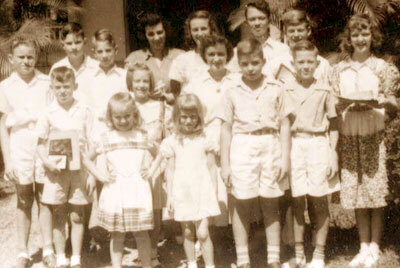 I had already started to school in America; I wanted to go to a real school, but there was none for a first grader. To my dismay, and I never got over it, each day my own mother taught me my reading, writing, and arithmetic. To get myself in the mood, I remember encircling what people called “the house made for foreigners” several times each morning, pretending I had traveled to school with the others. I was envious that my brothers rode with a driver to school in the car provided for us. Doing workbooks with my mother did not seem like real school. I also remember us going on Sunday afternoons to play at a large house with an expansive yard so big that I dreamed of that place, even into adulthood. We would visit the few other English-speaking families. There are names on the back of pictures, like Wells, Grether, and Buker. I do not remember that the big house had bars over the windows, as ours did! We were happy and not afraid, so I do not know why we had bars over our windows. 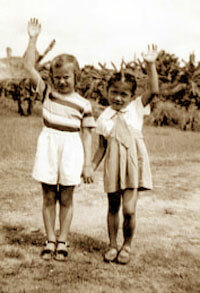 Occasionally I played with a Thai friend, Neeta, who lived next door to me in a teak house built on stilts (her picture is here). I only remember playing with my toys - just two of them that I was able to bring. I had a baby doll with handmade clothing sewed beautifully by my mother, and a toy sewing machine, which we took from America. One of my father’s co-workers Mr. Auchin brought me a child-size teak table and stool; this is probably my most treasured item in my home today. I remember my friend’s house was on the west of ours, that our houses were on the left side of the road going to the Sutep Mountain, and that there were rice patties around, between, and across the road from our houses. The road was elevated above the rice patties. There was no zoo and no Chiangmai University between the mountains and us. We were only a short distance from the river and outside of the town walls. But my brothers and I do not remember if we lived off the Sutep Road or the Huay Kaew Road. What I do remember is that everything green grew around our house, including coconut trees behind our house, a banana grove between my house and Neeta’s, and new orange trees in the front yard, no taller than I. One day we had a big scare in the banana grove. It seems my brother Kenneth ran upon a snake, and we all scattered screaming “bloody murder.” My elder brother now tells me still of that frightening experience. Once I picked a fruit from one of the front yard trees, only to be terribly scolded. It was green. I ran in the house to see if our cook Tan knew what fruit I was about to eat. Mother cut it open to find it was orange! An orange with a green skin. When I returned in 1988 to Chiangmai, these orange trees might have been the only things that I found remaining of where I once lived. I still do not know exactly where I lived; but I did find a grove of orange trees along Sutep Road and it made me wonder. People said an “American” house used to be nearby. I also wish to see the spot where I once lived. One day our father’s co-worker friend Mr. Auchin delivered a parrot. Kenneth said it was a gift to him, but I think it belonged to me. The friend also gave my brothers a black dog name Myo. I remember being pals with the seven people that worked for our family. One recollection is that of being in the back yard where there was an open cooking fire, being offered food that I had never seen before; it was a little difficult for a small child to eat or to refuse - even the roasted roaches. The man named Tam that cooked our food made homemade potato chips, always to all our delight. Finally, I remember fondly what made me distinctly uneasy as a little girl - the geckos that crawled up and down my bedroom walls every night. I must admit that, each night last week in Chiangmai, as I prepared to turn in, I looked carefully for my old wall-climbing friends. I only saw them once ... outside. I am home now, already mentally preparing for my return. There is still much to learn about Thailand. I want to take my friends. Another dimension of Thailand has already begun: I returned with a dozen spectacular examples of the ancient art of weaving basket pocketbooks. A new dream will unfold as I share these art pieces with American women who appreciate the intricate work so rarely found in our country. And Emily will return on another day to help in another way. Her three brothers will find their cause, probably in the rain forests, in their thought the greatest treasure and resource of Thailand. The Ultraman Thailand Tour 2003 performances will be held at the 700 Years Anniversary Sport Complex from April 5-7. Chaiyo Productions will organize the light and sound show, special effects stage performances, and an Ultra-Carnival for Chiang Mai Children. 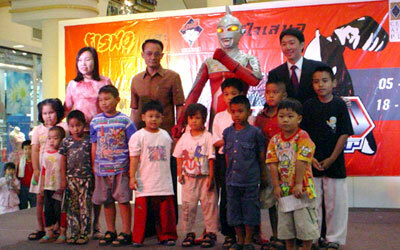 “Ultra Seven”, one of the Ultra brothers, came to see Chiang Mai children at Central Airport Plaza. Four Ultraman live shows will be performed each day during the tour, and each show will include a concert from “Hyperbotz”. In the Ultra Carnival, anyone can enjoy the Ultraman Theme Park and take pictures with the real Ultraman at no charge. Chiang Mai is one of 4 cities selected for this Ultraman Tour, following the success of the production company’s “Ultraman Millenium Live Show” in Bangkok in 2001, as well as the “Hero Festival” in 2003. Nuttakorn Srisurat, Chiang Mai Provincial Education administrator, said that this activity can be enjoyed by children and their families. The carnival is a nice present for the kids during this summer, and a real family affair. Those interested can purchase tickets from March 21 onwards, at Kad Suan Kaew Shopping Complex’s Public Relation Counter; costing 80 or 120 baht per person. Having seen what Jeep and Lek have been doing for the last five years to help educate Thai children with their “Computers For Thai Kids Charity Project”, five Thai girls (and Nung’s mother), held their second fund raising event (called a “Do” in England) in Bungay, England. (L to R): Sally Lee, Mr. Bundit Chotikanta (Pattaya Law Consultant), Nung’s mother, Nung Lee, Lek (Computers For Thai Kids Project), and Khun Khumkhaen Imjai (Principal, Ban Oop Mong School). The three Thai men in the very back row are the Pu Yai Ban for Nong Wua So and two schoolteachers for the Ban Oop Mong School. The couple responsible for planning and organizing the “Do” are Steve and Nung Lee. The Green Dragon Pub in Bungay donated their premises for a Sunday and the girls cooked Thai food and sold it to patrons and friends. The five Thai women who live in Bungay and did the cooking in the wee hours of the morning were: Nung Lee, Sila Holland, Malai Hansey, Kaew Jenkinson, and Gai. Much of the food was donated by the pub and a local Thai restaurant named Thai Kitchen. A raffle was held at the event with prizes of Thai cookbooks donated by Thai Airways, and many prizes donated by the patrons of the event. Steve and Nung’s daughters, Sally and Samantha, sold the raffle tickets and said that the raffle tickets to help the Thai kids in Thailand sold out quickly. About 100 people showed up to enjoy the Thai food and participate in the festivities. All who attended had a great time and have asked the girls to please do it again in the near future. The girls are already planning on having a barbecue in the summer months if the weather allows, and another party in the fall. They said that the feeling they had while raising funds to help the disadvantaged Thai kids here in Thailand was overwhelming and it was a win, win, win, win situation. Some of the people attending said it was not long ago that they too were not in such an advantaged position as they are now and that to give something back was a very good feeling. The girls say they all won by being able to get together and cook, the pub won by having many more customers than usual on a Sunday, the sponsors won with great advertising, the customers won by having copious quantities of Thai food and celebratory drink, and most important of all, the Thai kids Jeep and Lek are helping won through the donations. Steve and Nung Lee and Keith and Sila Holland, are here in Pattaya now to present 690 Pounds Sterling raised for the kids. Jeep said, “Boy, if we had a couple more of these charity events a year we could help a lot more of the poor Thai kids get a little further ahead in life. This donation came at the perfect time since we needed funds to fix up the last of the computers donated to us by the Bangkok-Pattaya Hospital so we could send them out to schools, plus the tuition is coming due for a lot of the 82 kids we are sponsoring in government schools. The picture shows the last of the 36 computers that were donated by the Bangkok Pattaya Hospital being donated to the Ban Oop Mong School in the village of Nong Wua So, which is located outside of Udorn Thani. It seemed like the entire village of Nong Wua So showed up for the donation of the computers, from the Pu Yai Ban on down. “The local Thai lawyer who set up this transfer to this very deserving school and a couple of other schools in the Chachoengsao area is Khun Bundit Chotikanta. He has been very helpful in finding deserving schools and helping us clear a lot of the paperwork that is involved in running a charity project here. Since its inception, the Computers For Thai Kids Charity Project has sent out more than 350 computers to schools all over Thailand, have given computer instruction to hundreds of poor Thai kids in Pattaya, and are sponsoring 82 deserving kids in government schools. When funds are available, the kids coming for computer instruction are also fed a nutritious meal after their classes. For some, this is the only meal they receive each day. Jeep and Lek need all the help they can get to run this project and have requests for thousands of computers from hundreds of schools throughout Thailand. If you have any working computer equipment in the Pentium class and above that you have upgraded or can spare, this is the place to donate them, as they do get out to the neediest areas and this charity project is strictly volunteer with no one on any payroll or receiving any remuneration for their efforts. All the computers must come from inside Thailand since Thai customs procedures preclude importing donated computers from abroad. The project can also use funds to repair donated computers, feed the kids, and to help support the most needy to stay in school. Prime Minister Thaksin Shinawatra opened a 2-day workshop for kindergarten teachers in Chiang Mai on March 22 and 23, at Chiang Mai University Convention Hall. 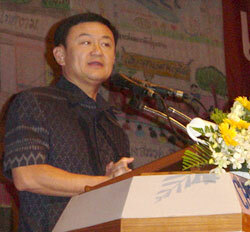 PM Thaksin addresses the participants. More than 3,500 kindergarten teachers from 17 provinces within the Northern Region Network, 19 provinces within the Northeastern Region Network, plus the Border Patrol Police School participated. After the opening ceremony, PM Thaksin delivered a message on the topic of ‘Childhood life of Uncle Thaksin’, which reflected his own pre-school memories and the impression he had of his teachers during his kindergarten period. He remembered his childhood in Samkhamphaeng District, where he was born and raised, as ‘full of happiness and a lot of fun’. About 3,500 kindergarten teachers assembled for this workshop. PM Thaksin responding to questions from participants. He hoped that teachers would be realistic and become more self confident about their own role. He also added that couples should choose the right time to become ‘parents’ after they have established themselves, their business, and having developed their ‘consciousness’ to be parents. Dr. Chris Weckert, assistant director of the Professional Experience, and Principal of the School of Education at the University of Newcastle, New South Wales, Australia, represented the local Rotary Club, which had raised 125,000 baht to give to Suksasongkhro Chiang Mai School. This amount of money had been spent to purchase teaching material for teachers and students at the school. Dr Chris (third from left) with her husband (second from left) presented books and educational items to K. Prayadsak, director of the Welfare Education Division (fourth left), and K. Jarun, director of Suksasongkhro School. During the ceremony on March 21, the items were gratefully received by the director of Welfare Education Division, Prayadsak Bua-ngam, and the director of Suksasongkhro Chiang Mai School, Jarun Nilplub, with a number of teachers and students representatives in attendance. While teaching in Chiang Mai, Dr. Chris worked with Thai teacher Dr. Boonlert Compan, both trying to encourage students to continue their studies through to graduation. Unfortunately, many of them have to leave school earlier, because their family cannot afford further education. 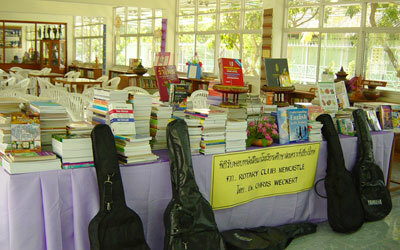 The donations included books for students from Prathom 1 to Mathayom 6, as well as a number of musical instruments. “I find it very beneficial to share time with students,” said Dr. Chris. 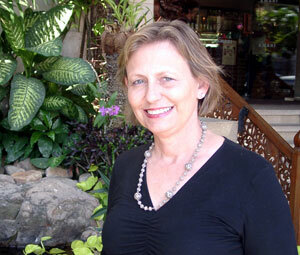 She was spending her evenings and weekends to advise and teach students to practice their conversational English skills. Although Dr. Chris will return home shortly, the second part of the project is actually very close, with six of her student trainees coming to teach in Chiang Mai. Two of them will go to Suksasongkhro School, and four to the Rajabhat Institute Demonstration School. Don Luang in Lamphun Province will hold a grand opening ceremony for the cultural handicraft street, called “Tang See Auad Line Pa Fai Don Luang” (Don Luang Cotton Fabric Fair), to promote ecotourism in Pasang District, Lamphun province. 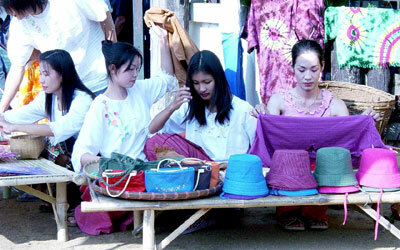 Local girls get ready to present their cotton-made goods to the public. Prasert Phupisit, chief of Lamphun Provincial Administration Organization, said it was their policy to improve the economy and standard of living by using local knowledge, which would be the basis for community strength. He envisages that the Don Luang Village will be the center for cotton products, as almost every household is, in one way or another, involved in a cotton-related activity, such as cotton weaving and cotton manufacturing. The cotton fair will be held from April 4th until 6th, and will focus on handicraft villages and culture, and the way of life of the Pa Sang people. 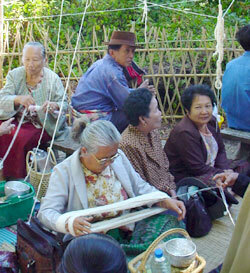 During the day, visitors can try their hand at handicrafts, weaving, painting, or dyeing. During the evening on April 4th, there will be performances and folk songs presented by famous artists in Lamphun, Parinya Tungtakul, and Ajarn Add Panutat’s team from Chiang Mai University. On the night of April 5th and 6th there will be performances from students and local people from all over Pa Sang District. For more information contact tel. 053 511 191 (office hours). Dousing by an elephant perhaps? Chiang Mai Zoo and the Mass Communication Organization of Thailand will organize “Happy Songkran”, a culture festival for 3 days at Chiang Mai Zoo, with many activities focusing on families’ participation. 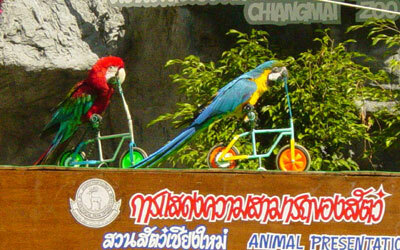 The animals at Chiang Mai Zoo have prepared a special talent show and are ready for the Songkran Festival. Tanong Nateepitak, the director of Chiang Mai Zoo said that it will join in the celebration of Songkran during April 13-15 by arranging many activities such as “Healthy Elders Contest” and Songkran Kids Contest. The contests, to be held on April 13, are to preserve local culture, show respect to the elders, and create a close relationship between children and their families. 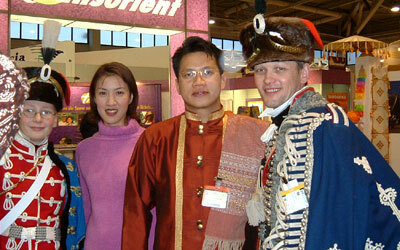 The competitors, both the old and the young have to wear Lanna-style costumes. The elders must be between 65-80 years of age and have a current health assurance letter from a hospital. The Songkran Kids Contest will be open to healthy 8-10 year-old girls. The contests will begin at 8.30 a.m. for the elders and 10 a.m. for the children. 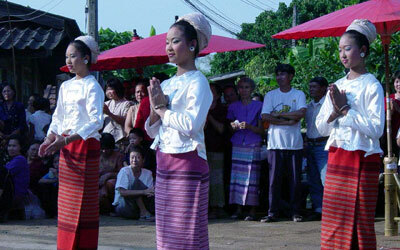 During the festival, there will be “ron nam dam hua”, a unique ceremony performed by pouring lustral water over the hands and feet of the elders, asking for forgiveness and blessing, making merit, worshipping the Koo Din Khao Temple’s ancient remains, plus student stage performances, a concert from Chiang Mai German Beer Brewery, and animal talent shows as well. Contest winners will receive shields from Prapat Panyachartraks, Minister of Natural Resources and Environment, Chiang Mai Governor Pisit Khetphasook, president of Provincial Administration Organization Udornphant Chantraviroj, and Chiang Mai Mayor Boonlert Buranupakorn. They will also win cash prizes, scholarships, and souvenirs. Those who require more information are invited to contact Chiang Mai Zoo from now until 4 p.m. on April 10, or call 053 221 173 ext. 12 during office hours. 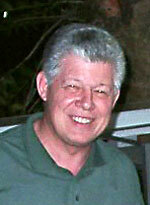 Frank J. Weicks was assigned to the U.S. Drug Administration’s Resident Office in Chiang Mai in mid-1998. In the five years he has been here, he has made a significant contribution to the people (especially underprivileged children) of this region, and has served as an example of what an American living and working abroad should be. Within six months of his arrival, he was invited to join a small group of expatriates and Thai people in their efforts to support the fledgling foster care program at the local government orphanage, Viengping. The administrator, a trained social worker, had just started the first foster care program in the country and needed a vehicle to transport children and supplies. The group organized a gala dinner and auction in the garden of one of the members, sold tickets and raised enough money to purchase a new double cab truck. Within a year, the population of the orphanage was reduced by one half as children were successfully placed into family foster care settings. The organizing group incorporated into an education foundation the second year, the Foundation for the Education of Rural Children, and made the gala an annual event. Frank offers up his culinary skills as a native of New Orleans at the galas, and has “sold” for over $500 US each year to prepare a traditional New Orleans dinner. The foundation has built two schools, a resource center and a dormitory and has funded many scholarships for poor children in the rural areas of Thailand. Frank has also been actively involved with the educational and humanitarian efforts of Rotary Chiang Mai West since 2000. He is a member of the Rotary International Committee and the Grants Chairman. Through Rotary, over 4,000 donated English language books were presented to five area public schools that could not afford them by officers of the USS Carl Vinson. Frank has also facilitated an international group study exchange program between his Rotary District and that of the district of Massachusetts. Working through Rotary International, young professionals in this program spend a month in the U.S. and Thailand meeting and learning about the other country and its culture. The purpose of the program is to promote peace and cultural understanding. In addition, he has written grants to Rotary International to match retired teachers and medical professionals from the U.S. with needy communities in Thailand. Because of his association with the missionaries on Clean-Up Day, Frank was asked to assist in placing students from Brigham Young University into volunteer teaching positions in Chiang Mai. With help from retired educators in Chiang Mai West Rotary Club, the students were placed in schools and non-governmental organizations. They helped with English language curriculum development, taught teachers and students alike, and formed lasting friendships. Chiang Mai University Medical School has developed a program for infants with low vision. These children are born with conditions that cannot be treated with medication or cured with surgery. Frank took it as a personal challenge to match Rotary Clubs with an interest in vision problems with this program, and was successful in raising the money to purchase Teller Visual Acuity Cards for the infants and small children treated in the Low Vision Program. These are the first diagnostic tools of this kind to be used in Thailand. In addition to community service projects, Frank is a regular volunteer speaker at several local forums as well as a teacher and trainer both locally and throughout Thailand. It is not uncommon for him to spend weekends providing opportunities for adult learners to practice English or interviewing prospective exchange students to English-speaking countries with local teachers. On a lighter note, Frank is a regular as Santa at the Consul’s Christmas party and has taught the intricacies of Creole cooking to more than a few Consul classes. 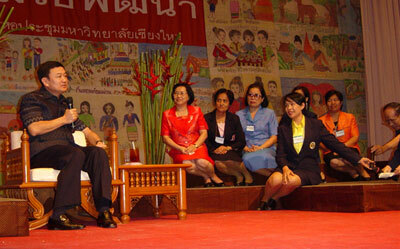 He also sings in the Chiang Mai Choral Society, which performs several times a year.